While it at first seemed like a “why bother” race — the winner will sit on Allegheny County Council for just six weeks — this special election has turned into a “why not me?” race. 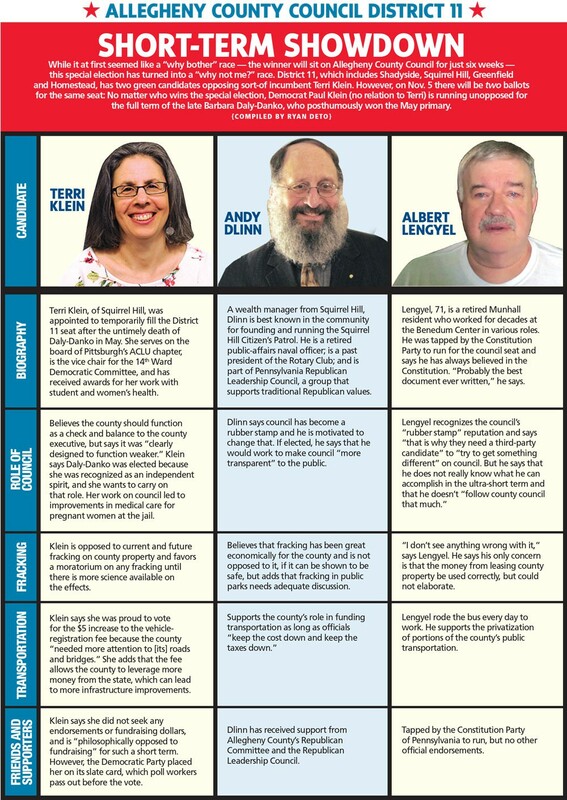 District 11, which includes Shadyside, Squirrel Hill, Greenfield and Homestead, has two green candidates opposing sort-of incumbent Terri Klein. However, on Nov. 5 there will be two ballots for the same seat: No matter who wins the special election, Democrat Paul Klein (no relation to Terri) is running unopposed for the full term of the late Barbara Daly-Danko, who posthumously won the May primary.